Provided you have time to spare, the flexibility and quality of tones make the Voluum well worth getting lost in. Stupefying tonal potential. Good manual. Full of (pleasant) surprises. Rock solid build. Could do with a bigger screen. Volume has never been the sexiest effect, but the genius Brits at Sonuus might just change all that with the Voluum. It packs five analogue effects - noise gate, compressor, LFO (tremolo), volume and limiter - all of which can run at once and offer a staggering amount of flexibility thanks to digital control. "The amount of potential here is stupefying, so the factory presets make a solid launchpad for your own patches"
Effects are tweaked using the minimal control layout and LED display - initially, we were a little flummoxed, but 15 minutes with the well-written manual explained all: press the effects knob to select the effect, the active button to activate it, then use the up/down buttons to scroll through parameters and twist the effects knob to adjust 'em. Every effect defies expectations: volume can give you string-like swells using envelope control, gate cuts your decay short for synth-like blips, plus you get full treadle or envelope control of tremolo rate and rhythmic stutters. 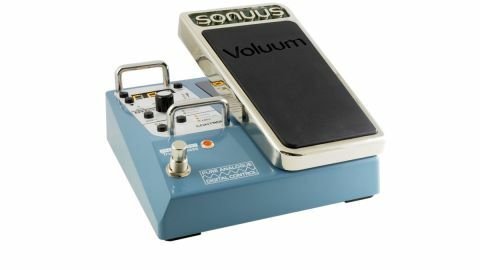 There's no faulting the 'normal' sounds, either: the compressor is as transparent and smooth as any optical unit we've heard, while the volume pedal itself is hugely customisable, and can even be used as a boost. The amount of potential here is stupefying, so the factory presets make a solid launchpad for your own patches - and while we would have liked a bigger screen on the pedal itself, Sonuus's Editor for Mac/PC makes creating and saving presets a whole lot easier.